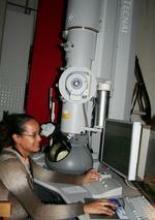 200 kV field emission transmission electron microscope with monochromator. 1 Å in TEM and 1.4 Å in STEM. Equipped with a Gatan tridium spectrometer for electron energy loss spectroscopy spectra at high energy resolution <0.2 eV, optimized recording of energy filtered TEM elemental maps, EELS low-loss studies (e.g. band gap analysis), and chemical bonding information at nanometer resolution. The Tecnai is also able to do electron tomography, which produces 3-D structures from 2-D projections, by acquiring an image every 2 degrees at angles +/- 70 degrees. This is only possible using our tomography holder and specialized software. 2-week reservation window in Coral. Reservations should be minimum of 4 hours with start times at 8 AM or 1 PM to maximize instrument usage. One reservation per week permitted during any 1-week window. Additional times can be reserved if within 48 hours of the start time. Contact manager for any reservation exceptions. 120 kV usage on Thursdays and Fridays only to allow for voltage changes.